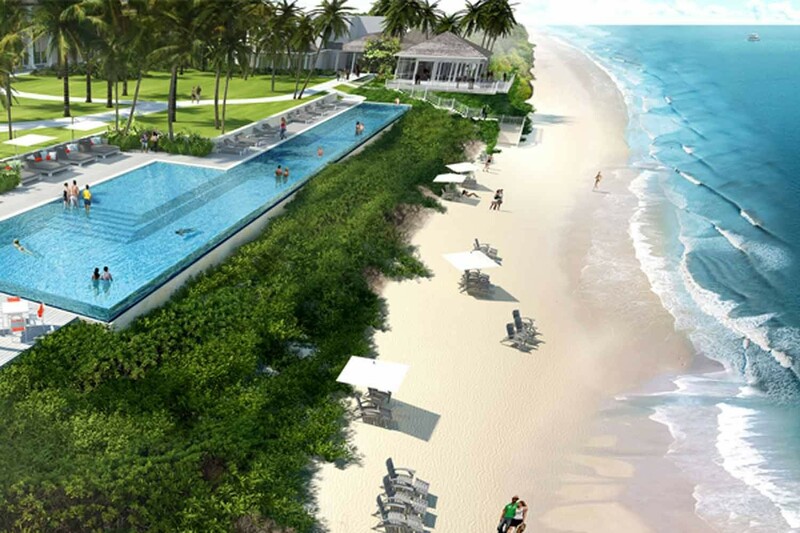 Exclusively reviewed for Holidays in Heels by travel pros Lawrence Travel! 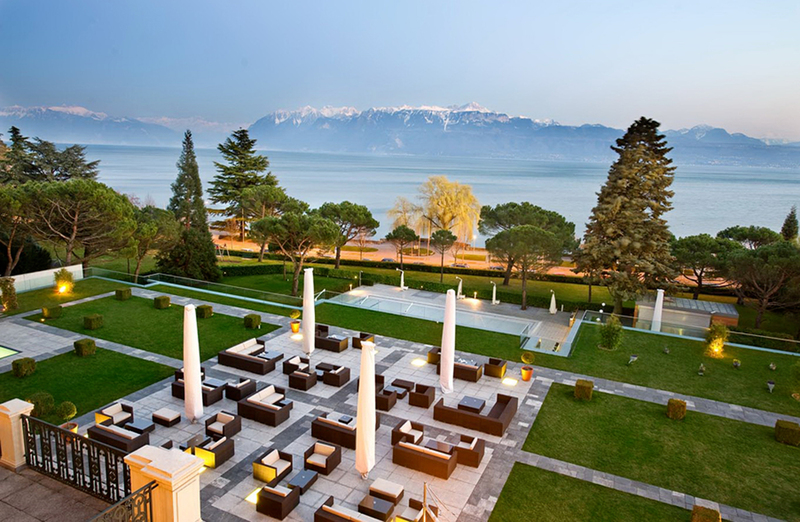 Set on the quay of the pristine Lake Geneva, this exquisite belle epoque palace hotel oozes history, charm and Swiss sophistication. 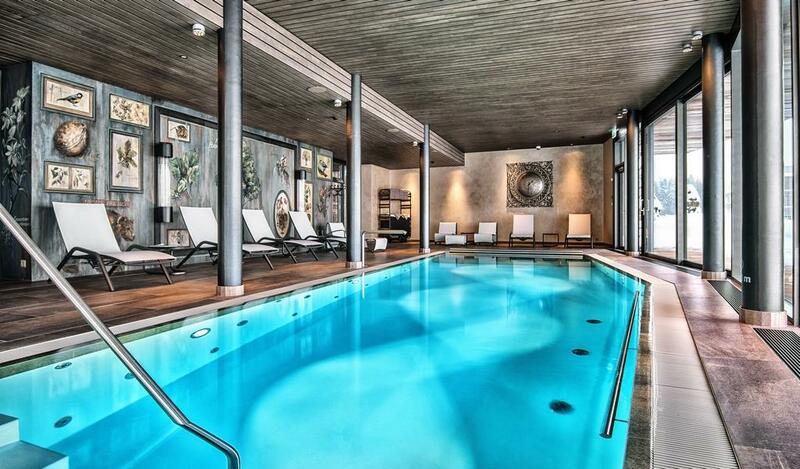 The setting is serene with the lake on its doorstep and the Alps functioning as a robust backdrop. Entering the Beau Rivage Palace is like entering a time warp: the revolving door with doormen on either side guides you to the three story lobby decorated with balustrate floors looking up. The marble on the floor hints to former days, as well the wooden panelling on the walls. A fresh flower decoration reflects the time of year with seasonal colours and ornamental shrubs. The glass elevator is elegant, yet is in pristine modern-day condition. We are welcomed with smiles and Swiss precision as our bags are carried to our room. We decide to visit the Lobby Lounge to taste our first fine Swiss chocolate – melted, as in hot chocolate. A delightful way to enjoy our first moments in Beau Rivage Palace! 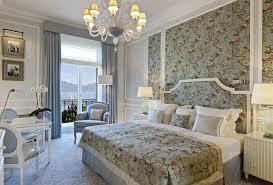 The largest suite is located on the first floor facing Lake Geneva, or ‘Lac Leman’ to the locals. In the olden days, the ariscocrats only had to walk up one flight of stairs to enter their suite. The first floor was the most elaborate, decorated floor in most Belle Epoque hotels and housed the bold penthouse suite with equally stunning views. Decorated with intricate detailing such as detailed ornaments, silk wallpapers, crystals chandeliers and colourful velours the suite highlights the best of the former era and complements that precious time with fine-tuned up-to-date amenities. The rooms along the newly renovated wing are charming as well as a perfect fit for a romantic weekend away. Soft tones of beige, yellows and blues complements the crisp outdoor views. Don’t forget to take a calming bath and open the mirrored wall to the outdoor views – it doesn’t happen often these views can be enjoyed from a bathtub. The french doors to the balcony offer the entrance to the best panoramas as well as the most exquisite fresh air, a perfect place for a morning coffee or a late night drink. Having to admit the room design is ladylike and the marble and gold detailing in the bathroom lavish and chic, all-in-all the rooms exudes charm and the finest of sophistication for all. 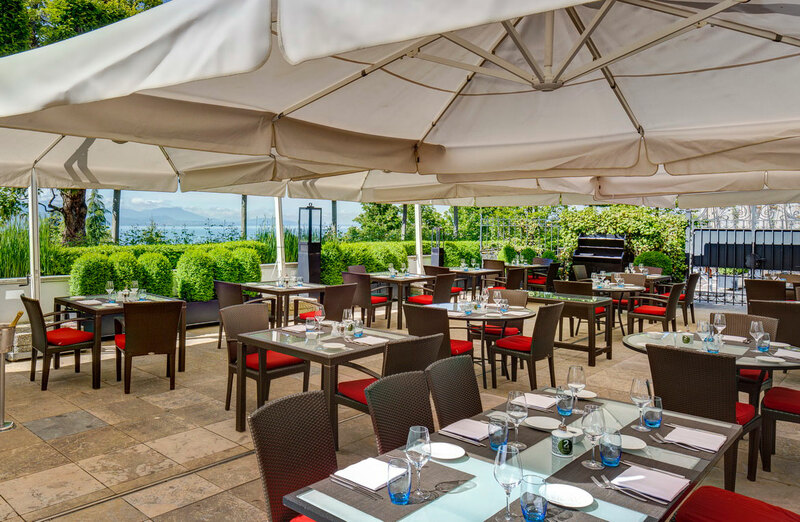 The hotel’s brasserie de luxe Cafe Beau-Rivage is the perfect setting to enjoy one of Vaud’s traditional dishes, fillet de perch. A delicious fish caught straight from the lake you are overlooking. The menu is fine-tuned to the international traveller yet highlights all Switzerland has to offer ‘in-house’. A must-try experience is the gastronomy from Anne-Sophie Pic, the first woman to be voted chef of the year by the Michelin guide, and who supervises proceedings at the gourmet restaurant of the hotel. Breakfasts are lavish and healthy, with a twist of sugary danish for those with a sweet tooth – making it hard to stop at just one sticky delicacy. In wintertime the gardens capture the seasonal spirit adding a ice skating rink serving warm chocolate drinks on the side. The sheepskin decorated lounge chairs are the most comfortable to relax and enjoy an afternoon tea, or that second mug of cocoa. The Beau Rivage Spa Cinq Mondes is a highlight for those wanting to slow down and catch their breath. The spa menu receives international acclaim and extends its services by providing rejuvenating and revitalizing massages and facials, a his and her hammam and two pools – one indoor and one in the green palace hotel gardens. It is here in this luxurious setting where famous folk mingles, where we are forgetting everyday routines as if time stood still and all we have to worry about is the circumpherence our crinolines for the evening ball – if even that. You can also take a stroll around the area: the prettiest part is the course from Lausanne to Montreux, where the lakeshore is designated to a UNESCO World Heritage site for one special reason, its vineyard. Known as Lavaux, and dating back to the 11th century, every possible square inch supports cascading terraces of vines, 10,000 to be exact. Surrounded by vast natural beauty the Vaud region holds the title “Best Roadtrip Destination” for a reason, offering World Heritage sites as well as darling mountain villages a little further afield.